“Tirupati Laddu” which is popularly known as the “Srivari Laddu” – the mouth watering, delicious and yummy Laddu, which is the mainstay of Tirumala Tirupati Devasthanam Prasadam for more than 300 hundred years. The taste of Tirumala Laddu is spread all over the world. The mouth-watering Laddu and vadai, the likes of which is not prepared elsewhere in the world. It is a ‘sweet favourite’ of the young and the old. The Tirumala Laddu has become synonymous with Tirupati. Can we return home without Tirumala Laddu after having the divine darshan of Lord Venkateswara? Never! There is no satisfaction in doing so. Every devotee returning from Tirupati will necessarily distribute ‘Laddu’ as prasadam to his friends and relatives. 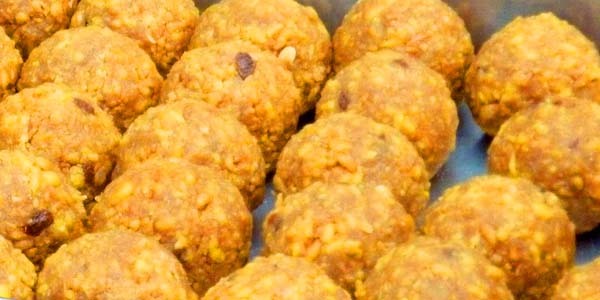 The reason for such a popularity of Laddu among pilgrims of Tirumala is its unique flavour, characteristics and never compromising quality of Laddus ever since it all began distributing 300 years ago (though the size of Laddu has reduced over the years.) More importantly Laddu is the favourite naivedyam of Lord Venkateswara himself. By eating this Srivari Prasadam the devotee forgets all the sorrows and hardships he suffered while reaching the hill top of Seshachalam for the divine darshan of Lord Venkateswara and get back to his destination with a pleasant and joyful heart and soul wishing for a return journey at the earliest. The architect of the ‘Laddu Empire’ is Kalyanam Iyengar and was the brain behind making Laddu synonymous with Tirupati. He was the uncrowned monarch who had several hundreds of men working in his ‘kingdom of divine offerings’. An embodiment of virtues and humility, he was named Kalyanam Iyengar by the great politician wizard Rajaji because he donated the Thali – the wedding chain and wedding clothes to the needy. A philanthropist, he championed the cause of the poor and downtrodden. A connoisseur and patron of fine arts, he introduced music and dance festivals in Tirumala which is being followed till date. A person to emulate for his services to mankind is manifold. Under his stewardship his ‘subjects’, relatives and friends had a glorious time. He passed on the mantle to his son, brother and brother-in-law. His centenary, which fell on March this year, was celebrated in a grand manner. “Endaro Manahanubhavalu Andarikki Vandanamu – Our Salute to all those great people.” His ideals and principles are observed by his benefactors. His culinary expertise has made ‘Laddu’ the mainstay of the prasadam in the ethereal Tirumala hills. ‘Laddu’ Ramesh was kind enough to disclose information about this delicious prasadam. The ingredients in the preparation of Laddu are besan flour (kadalai mavu), sugar, oil and cardamom and dry fruits. It is believed that roughly about a 1.25 lakh Laddus are prepared every day. The workers who prepare Laddus work in shifts. They have a firewood oven and gas cylinders are also used. As and when the Laddu material is ready, a set of people makes it in the form of a small, round ball. There are two types of Laddus – small and big. The weight of the small Laddu, as soon as it is shaped into a ball, is 178 gm (wet). After sometime, it dries up and the weight is reduced to 174 gm. Similarly, the weight of the big Laddu while wet is 720 gm and it decreases to 700 gm after it dries up. Besides the world-renowned Laddu, the potu staff also prepares different types of variety rice, savouries and sweets. The period from 1996-2001 was a time when the TTD prepared Laddu and other prasadam themselves. It became difficult for the TTD to increase the number of Laddu per day. The influx of pilgrims meant distribution of equal or more number of Laddus. They also had to cater to other ‘Sevas’ and Kalyana Utsavam. It became a Herculean task for the officials. The temple of Seven Hills, Tirumala Tirupati, is one of the ‘Swayambu Kshetras’ where Lord Venkateswara stands imposingly resplendent in precious gems. A surge of excitement and devotion descends on the devotee who stands spellbound in front of the Lord. We are jolted back to normalcy at the calls of “Jaragandi”. The divine atmosphere is enhanced by the aroma of ghee and oil which wafts inside the hallowed shrine. Yes, Tirupati and Laddu are synonymous. We think of Laddu once we hear the name Tirupati. Laddu is the main offering (prasadam) to the presiding deity. The huge vadai occupies the next position. There are five Laddu mirasdars who had deputed Kalyanam Iyengar, who had made Kalyanam Iyengar as the agent. He was the main person there. Kalyanam Iyengar later in due course time inducted Aravamudha Iyengar as brother and his brother-in-law N S Srinivasachari. The preparation of myriad variety of prasadam is to be made by the nominated persons. This was the procedure till 1996. They were allotted a ‘potu’ (a large kitchen) inside the temple premises itself. The offerings to the Lord should be done inside precincts of the temple complex. Ramesh, known mostly as ‘Laddu Ramesh’, is the youngest son of N A Srinivasachari, and has been assisting his father in managing the ‘potu’ from a very young age. He grew up in an ethereal atmosphere, where visit to the temple and potu was compulsory everyday. To many of us having a holy communion with the Lord is possible only once in a few years. But to him, it was a part and parcel of his day-to-day life and he learnt the nitty-gritty of the work. With God’s grace, Ramesh was called back after a break of almost four years. His return heralded a ‘golden era’ in the lives of the workers. Though some thousands of Laddus and some prasadam items are prepared by the TTD’s main ‘potu’ the temple authorities allotted a separate ‘potu’ for Ramesh. This is the story of ‘Laddu’ narrated by Ramesh who inhales the aroma of Laddu for it is the oxygen of his existence. That was the story about Tirumala Laddu and its making. Let us focus on the other side of Laddu. The increasing demand for Tirumala Laddus from the devotees had spawned a major black market trade in and around the temple in the last two decades. The Laddus were sold in black market at a cost of around Rs. 50 and more each by the black marketers with the involvement of temple officials. Even the authorities know what’s happening in their compound. They conduct raids and catch a few now and then to minimize the pressure. It has been going on continuously for years but there is no change in the happenings. I have been visiting Tirumala Temple regularly for the past eight years and I still find people selling Laddus in the black market. I do not understand why the authorities could not find and stop them from doing so. Now the situation has become so worst that Fake Laddus are being made and sold at various parts of Tirupati. Off late the authorities of Tirumala Tirupati Devasthanams has realized the dangers of it and applied for the patents of Laddus and finally got the “GI – Geographical Identification” certificate for the Tirumala Laddu. The Laddu is now under copy right law and nobody can copy it. Let’s hope TTD succeeds in protecting this delicious Laddu which can be termed as a prasadam that is liked by millions of devotees thronging to the Temple Town of Tirupati.